Welcome to Grill-Off with Ultra Hand! Nintendo first introduced the Ultra Hand to the world in 1966. People were fascinated by the little plastic arm that could reach out and grab objects. 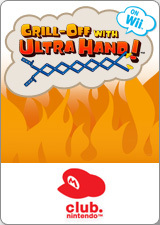 Now the Ultra Hand is back for the Wii console in Grill-Off with Ultra Hand! Use the Ultra Hand to pick up pieces of meat from the grill and deposit them on the plate in front of you. Just make sure you grab the meat before it burns to a crisp! Challenge yourself to beat your high score in single-player mode or compete against a friend in VS mode. Let's get grilling! The graph below charts the compatibility with Grill-Off with Ultra Hand! since Dolphin's 2.0 release, listing revisions only where a compatibility change occurred. This page was last edited on 11 January 2018, at 11:51.